War & Peace drops on 2/23 -- and it's in bottles for the first time ever. The War & Peace is the first release in our all-new "Garage Series." We fell in love with homebrewing because every Saturday, we got to create an entirely new beer. Most were good, some were great, and others we simply chose to forget about. Homebrewing in first Jim's and later Peter's garages eventually lead to the beers our brewery is most known for today: Sweet Child of Vine, Lonely Blonde, Libertine, and Worthy Adversary. But what happens to beers that don't make it onto the everyday brewing schedule? Enter the Garage Series. It's a home for beers that don't quite fit in anywhere else. They are some of our brewers' favorite recipes, and can be experiments, infusions, aged in barrels, imperials...you name it. Garage Series beers aren't exactly seasonals; instead of being available for a full 3 months at a time, each release will only be available for a brief window each year. Garage Series releases won't be on a schedule you'd set your clock to, but you can expect to see one about every other month. War & Peace is the first release of the series, so read on to find out how to get yours. War & Peace is back! And for the first time ever, it's available in 750mL bottles. 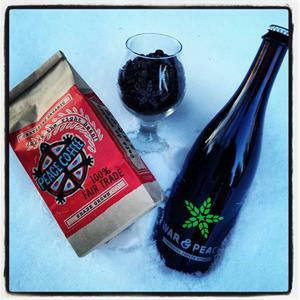 For those who don't know, War & Peace is an Imperial Coffee Stout infused with whole bean Guatemalan Organic Dark Roast from Peace Coffee. Want some? We're releasing it on draft and in 750mL bottles at our taproom on Saturday, February 23rd. Bottles are $15 apiece (tax included), and we don't have a bottle limit, so you can take home as many as you want. Sorry, no growlers will be available. The following Monday, 2/25, War & Peace will be available on draft and in bottles across the metro. As with all Garage Series releases, it won't be available for long, so seize the day! YOUR VALENTINE WANTS GROWLERS, NOT FLOWERS! The Top Ten Reasons to skip the flowers this Valentine's Day: 10) We're open for growler sales on Thursday at 3:00. And we don't mark up our prices just because it's Valentine's Day. 9) Nothing says love like IPA. (Though to be fair, nothing says "not tonight, honey" like an Imperial Stout.) 8) Hoppy beers are often commended for their floral characteristics... 7) ...but flowers are generally not known for having beer-al characteristics. 6) You can have a pint in our taproom while picking up your growler. Try that at the florist. 5) You can use an empty growler as a stylish vase, which could then be filled with flowers. 4) Or, just bring the empty growler back to us for a refill. We don't refill standard flower vases. 3) A growler may even last longer than the flowers you get these days (Depending on how thirsty you are, of course). 2) If you don't have a Valentine this year, it would be weird to buy flowers for yourself. There's nothing weird about buying yourself a growler. 1) Beer tastes better than flowers. As excited as we are for the upcoming release of War & Peace, it's bittersweet because it means the end of imperial stout season is nigh. Thankfully, we have a handful of Worthy Adversary casks over the next couple weeks to help tide you over until next year. 2/14 at Republic 7 Corners: Worthy Adversary with French oak. Available as a pairing with a lovely V-Day dessert anytime after 5:00. 2/15 at Grumpy's Downtown: Worthy Adversary with coconut & macadamia nuts. Tapping at noon. 2/20 at Muddy Pig: Worthy Adversary with maple wood & vanilla beans. First pours at 4:00.